“I am Hawa Moore and I live in the city of Kakata District of Margibi County with my three children. 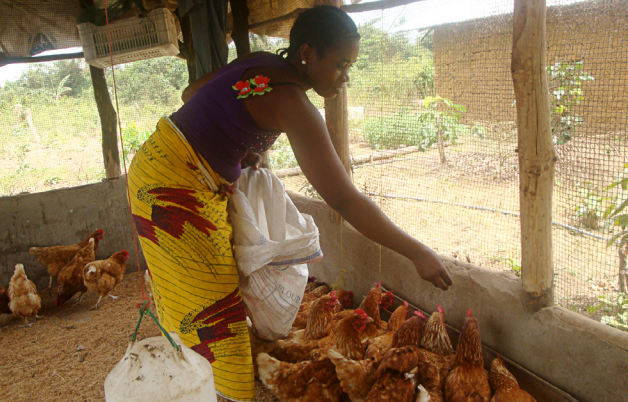 I was involved in poultry rearing and struggled to earn for my family, with very little money for food. malnutrition. Earlier, I used to rear poultry in the traditional method. I was not being able to provide proper feed and vaccination for my birds and lost many due to diseases. I heard about BRAC and its poultry and livestock programme from the community members and went to the regional office to speak to BRAC staff. BRAC selected me and trained me on poultry management and disease control. I received 50 one-day-old chicks of the commercial layer chicken. I also received quality bird feed in large quantities and I was linked with the livestock poultry promoter of my community for proper medication, vaccination and advice on rearing chickens.